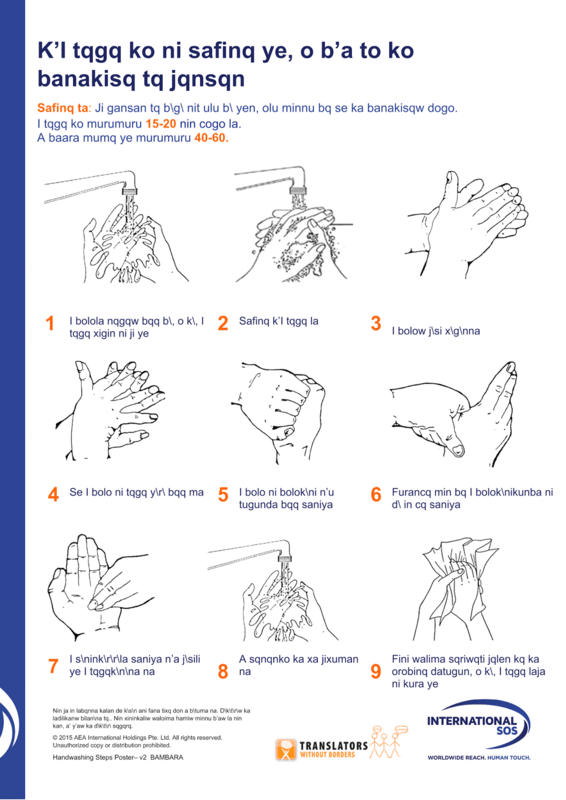 In an earlier posting, I highlighted a poster in Bambara on hand-washing, which had evidently been composed in a non-standard 8-bit font making it all but unreadable (see image on top right). I have written International SOS, on whose site the poster is available, and Translators Without Borders (TWB) which is listed on the poster, to signal the problem. 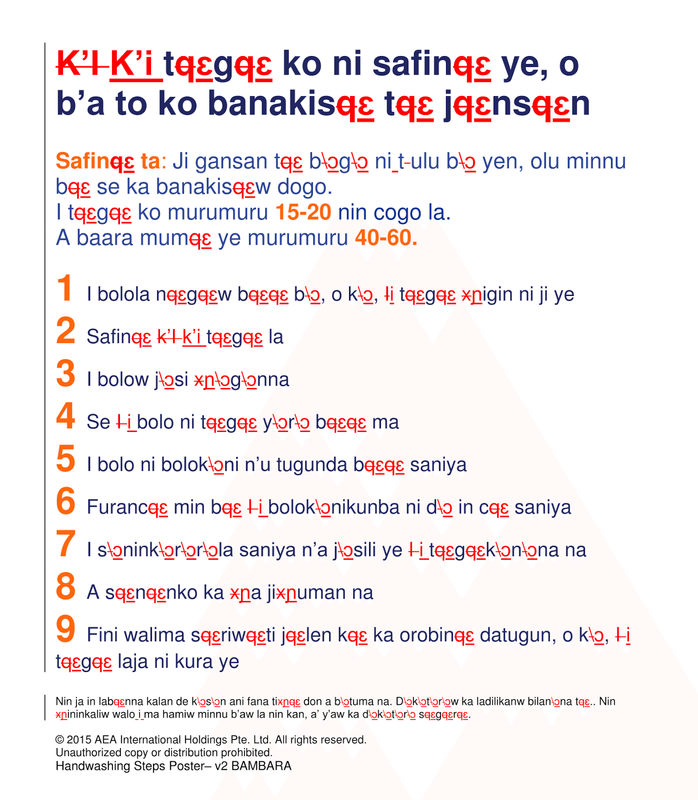 Since the issue has already been a subject on this blog, I would like to follow through with presentation of a corrected version (already shared with TWB), in the spirit of 2Ds+4Rs (reasons to repost African language materials). I'd also like to use this to raise the larger issue of the best licensing for such public education materials in languages that are less-resourced and/or less-widely spoken. This material is © 2015 AEA International Holdings Pte. Ltd. I am sharing it, as I have other materials in African languages from other sources, with attribution, in my understanding of fair use. However, this is not ideal. It would be much more helpful for the original purposes of creating these materials to use a Creative Commons license to encourage the kind of thing I'm demonstrating here, as well as more substantive re-use of such material. Would it be possible for organizations involved in authoring and/or translating extension and public education materials in African languages - not only for health but also other domains of social and economic importance - to agree on a set of "best practices" for facilitating their review, dissemination, revision, and re-use? For this particular document, what I did was to copy the text into a Word document and first run 3 search and replaces, since the problem with the document stemmed from it being in an old font that had certain letters substituted with "special characters" needed for Bambara. These were q → ɛ, x → ɲ, \ → ɔ. Then less than a dozen minor copy-edits, mainly changing capital "I" to lower case "i" - the software on which the original was produced was evidently expecting English text, and auto-corrected free-standing i's (i = second person singular pronoun in Bambara, not capitalized ) to capital I's. It was very quick set of corrections, but did not include any review of the translation itself - that would be easier now with the text that follows. Safinɛ ta: Ji gansan tɛ bɔgɔ ni tulu bɔ yen, olu minnu bɛ se ka banakisɛw dogo. I tɛgɛ ko murumuru 15-20 nin cogo la. A baara mumɛ ye murumuru 40-60.
kan, a’ y’aw ka dɔkɔtɔrɔ sɛgɛrɛ. © 2015 AEA International Holdings Pte. Ltd. All rights reserved. Unauthorized copy or distribution prohibited. Hint: It's all the same language. The New York Times recently featured an article on speakers of West African languages in the Bronx (a borough of New York City) that mentioned "Diula." From experience I realized that it probably is a less-often used spelling of the variety of Manding spoken mainly in Burkina Faso and northern Côte d'Ivoire, usually spelled Dioula (the French spelling), Jula (the usual spelling in the language itself as well as in English), or Dyula (also used in English and French). There are apparently other variant spellings such as Djula, Dyoula, Joula, and Juula (per various sources). The number of spellings for this language therefore rivals the number for Temne, which I discussed in an earlier posting. However in the case of Jula/Dioula the existence of multiple spellings is partly related to French phonetics (French being used officially in almost all the areas where Jula is spoken, and the language of the first European descriptions of Julas and Jula language). In French, the hard "j" sound in Manding (or English) requires using a "d," and the "u" sound corresponds to the French "ou," not the French "u." So now it looks like all the permutations between "Jula" and "Dioula" have been covered. The "dy" digraph appears to have been introduced in the 1960s and was indeed preferred over "j" for Manding in the famous 1966 expert meeting in Bamako on unification of African alphabets. By the time of the 1978 expert meeting in Niamey, however, that was changing: Côte d'Ivoire retained "dy" while Burkina Faso (then Upper Volta) was using "j." I'm not sure that "dy" is still used in Julakan (the Jula language) in Côte d'Ivoire. Nevertheless, it still figures in the repertoire of alternate spellings used for the language name in English and French. Unfortunately the multiple spellings probably lead to confusion, such as appears to be the case in the NY Times, which has in the past used Dioula, Dyula, Jula, and Diula. Also the use of French spellings in English can lead to mispronunciations by Anglophones - "dee-oo-la" instead of "joo-la" (I've noticed this kind of thing on multiple occasions over the years). In any event, one should be clear that there is no relation between Jula/Dioula and the dialect cluster known as Jola, Diola, or Joola (pronounced more or less like "joe-la"). That is spoken in the Casamance, Senegal and neighboring areas of Gambia and Guinea-Bissau. You hear a lot about "language barrier" - a term that I for one would just as soon replace with "language divide" or "language gap" - but what about navigating the less daunting but sometimes trickier differences between dialects or varieties within a language or dialect continuum? Yet this must be common to the experience of many people around the world, including most of Africa. Personally my biggest experience with this was transitioning in 1985 from Djenné, Mali, where as a Peace Corps volunteer I gained a certain competence in the Maasinankoore variety of Fulfulde, to Pita, Guinea, in the heart of the Pular-speaking Futa Jalon region. Actually it was unlike anything I've done before or since, even though I've encountered dialect differences more briefly elsewhere. Making the transition was kind of fun - and occasionally funny. The biggest initial difference I found between Fula varieties has always been the greetings, but they are relatively simple to learn. Then there was keeping track of different verb endings, not making the initial consonant shifts in verbs, and a few other grammatical differences. Most of this was on the fly, but as I mentioned in an earlier posting, it did help me to have Sonja Fagerberg-Diallo's learning materials for both varieties of the language. You can imagine that such differences could suddenly deflect a conversation into incomprehension or laughter. I recall a Malian co-worker in Djenné, Boubey Touré, who came from Rharous in the Songhai area in the north of that country, but who never tried speaking his language (what Ethnologue classifies as Songhay, Koyraboro Senni) with speakers of the Djenné dialect of Songhai (a distinct variety of Songhay, Koyra Chiini), for fear that some word he would say would would mean the opposite in local speech (as he put it). So he ended up mostly relying on Bambara in forestry extension work. When I went to Futa Jalon, I actually encountered the kind of situation Boubey referred to, but in Fula. The accomplished (roughly past tense) negative ending for active voice verbs in Maasinankoore is pronounced -aayi (even though generally written -aali), wheras the future ending for active voice verbs in Pular is pronounced -ayi. Essentially the same sound. So coming from one background and not knowing, one could actually say a lot of things that mean almost the opposite in the other location. The bigger lesson though is that an African extension worker like Boubey who is fluent in one language variety never had any training or materials to allow him to negotiate the dialect / language (variety) differences in his own country, while someone like me gets to go there as a Peace Corps volunteer, get all kinds of training for a second language, and then support and materials to transition to another variety of that language. I have much less experience with Manding varieties, but recall my first trip to the Bougouni area of Mali where people greeted me with "I ni se," a Bambara greeting I hadn't encountered before. It wasn't a different pronunciation of the widely used greeting, "I ni ce," and though it sounded disconcertingly close to the female response to greetings "Nse," it definitely wasn't that either. Then I realized this was the verb "se," to arrive. I ni se is a greeting on arrival. Welcome! Apparently this is common only in that region. It is always the greetings that are the most different between varieties. One more example from Fula: In Maasinankoore one could say on parting, Alla hollu en ontuma (God show us another time), while in Pular I only ever heard a short form of that, En ontuma. Most other greetings are just different. On a break from a PanAfrican Localisation workshop in Centurion (Tshwane), South Africa, Adel el Zaim, Dwayne Bailey and I took a walk over to a shopping area, and on the way out of one shop I looked back and read a sign "Dankie vir u ondersteuning." (What?) I asked Dwayne and he explained that it actually meant "Thank you for your support." English and Afrikaans are of course two separate though related languages, with some cognates, and evidently some faux amis as well. But this sort of example, even allowing for different spellings, of a concept ("under"+"standing") shifting meanings is something found between dialects as well. Another example is from my move from Mali to Guinea: In Maasinankoore, the verb doomude (or doomugol) means simply to wait, but in Pular it has the sense of waiting around at mealtime to be invited to eat. * Barrier or divide or gap? Quick note on terminology. There is an advantage I think to using a "divide" or "gap" rather than "barrier" to describe the situation where lack of common language prevents or hampers communication. In effect what we're actually talking about is a "communication gap" in need of a common language "bridge" or learning some key differences between dialects to exchange ideas and information and do so accurately. The gap/divide and bridge metaphor is I think quite powerful in portraying the problem and solution in the case of people with very different languages. In the case of dialects, the divide is not as wide or deep, and the problem is not as much inability to communicate, as running into mini-gaps such as differences in vocabulary or terms that are used differently. The knowledge need is more nuanced - figuring out what you know and don't know. So "dialect barrier" is no more apt here (I used it humorously in the title), but not sure of a better analogy. We are approaching the second anniversary of the genesis of the ebola epidemic in West Africa in Meliandou, a village in the "Forest region" of southeastern Guinea, and hopefully also its end in that country. The the epidemic of course also ravaged neighboring Liberia and Sierra Leone, which have recently been declared ebola-free, and threatened to expand across the region before concerted local and international efforts turned the tide. 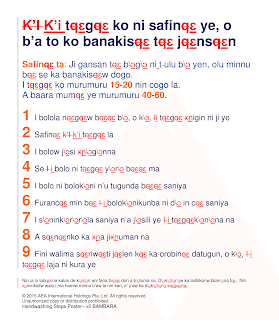 During the worst of the crisis I tried to highlight some of the ebola education efforts in African languages, with attention to some aspects that might affect their effectiveness to communicate messages. 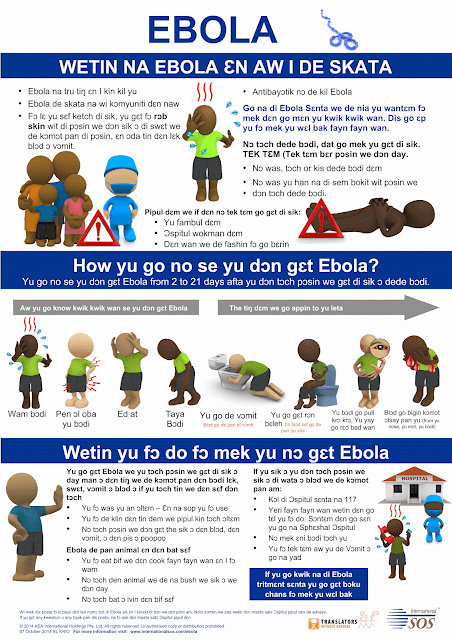 In that process I suggested that it is helpful to make health education materials in these languages widely available not only for their intended purpose, but also to facilitate improving them for future use, as summarized in "2Ds+4Rs: Why repost ebola info in African languages?" So for instance the Ebola Communication Network and International SOS sites each have some posters in African languages (along with other languages) and a few in the same languages. That's fine, but why not also bring all the African language materials from those and other sites, to a site only on African languages, and group the materials by language? Such a site could be maintained by one or more of language organizations like the African Academy of Languages (ACALAN), health organizations like the WHO Regional Office for Africa, or academic organizations such as the African Language Materials Archive (ALMA). In addition to the digital materials shared on websites - text as well as audio and video - I imagine there must be more materials in diverse languages on national levels. How to gather those is another question. On the theme of the importance of stories, I thought I'd pass on a call for chapters for an academic publication on writing by children in their first languages. The scope is global, including Africa. It is announced by Dr. Arieh Sherris, who is currently a Fulbright Visiting Scholar at the University of Education, Winneba, in Ghana. The lion’s share of the world’s living languages face a bleak future. A growing consensus of linguists predicts that by the close of the 21st century 50-90% will disappear. Efforts to reverse this trend are underway worldwide. The purpose of this edited volume is to provide case studies of revitalization efforts at schooling early writing among children between approx. 3 and 12 years in lesser-known languages from Africa, Asia, Australia, Europe, North America, and South America. For those interested, the full call is available on the Society for the Study of the Indigenous Languages of the Americas (SSILA) website. Following up on one of the topics of the previous post on this blog, here is some more recent information on use of the term "community language" in African contexts. That post discussed what I saw as a contrast between on the one hand a common use of the term in the West to describe a language of a minority community as differentiated from the dominant language of the majority population, and on the other hand, an African usage emphasizing a language spoken in a wider area, even as a lingua franca - implying "community" in a larger sense. 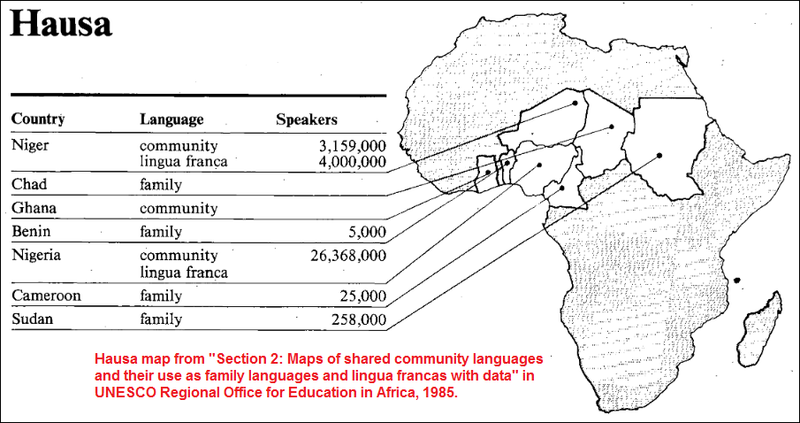 Regarding the latter, I came across an updated version of the 1985 UNESCO list of African community languages in the form of a map (image of the original PDF is on the right) and accompanying document, "Language of Instruction Policy and Practice in Africa," published in 2004(?) by the distinguished Nigerian linguist, Prof. Ayo Bamgbose. There are a number of differences from the original list, beginning with inclusion of South Africa, and listing of 212 languages (the previous version had 159). languages that are used for inter-ethnic communication. This formulation would seem to leave out widely spoken maternal languages that aren't also lingua francas (although any African lingua franca is also a mother tongue for some, and any first language that is widely spoken would likely also be used as second language by some). Still, this is different than the definition one finds in most references. Of course, "community language" at its most basic just means a language spoken by some community. A quick follow up search found other uses of the term in discussing language in Africa that shade somewhat between what I have been contrasting as a Western focus on communities apart, and an African one on communities that link. Birgit Brock-Utne, and Ingse Skattum, eds. 2009. 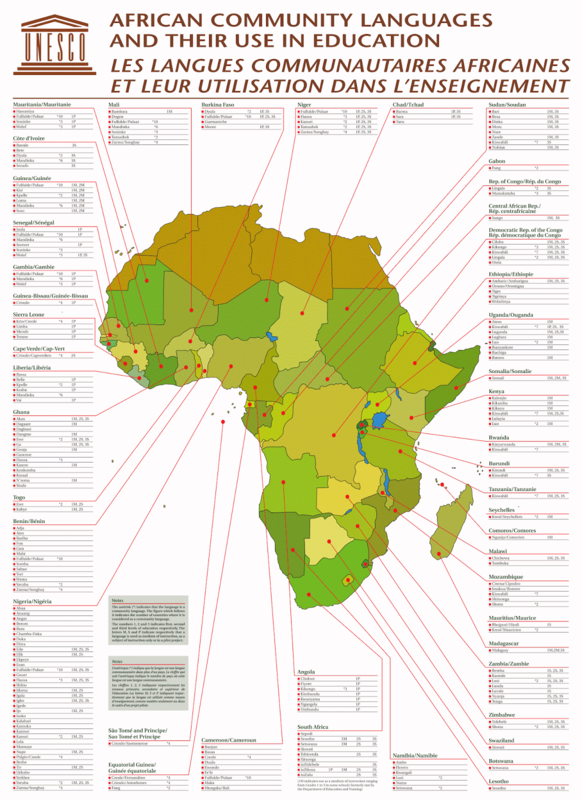 Languages and Education in Africa: a comparative and transdisciplinary analysis. Symposium Books. Jo Anne Kleifgen, and George C. Bond, eds. 2009. The Languages of Africa and the Diaspora: Educating for Language Awareness. Multilingual Matters. 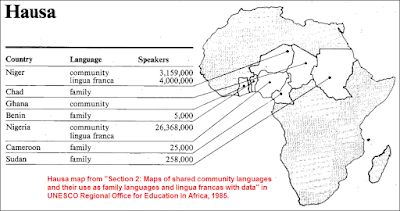 Working on preparing the PanAfrican Localisation (PanAfriL10n) wiki for relaunch, I recently returned to one particular reference - a 1985 UNESCO document and its use of two terms which have meanings in Africa that differ somewhat from mainstream (Western) definitions: "community language" and "national language." The document in question is: UNESCO Regional Office for Education in Africa, 1985, African community languages and their use in literacy and education: A regional survey. 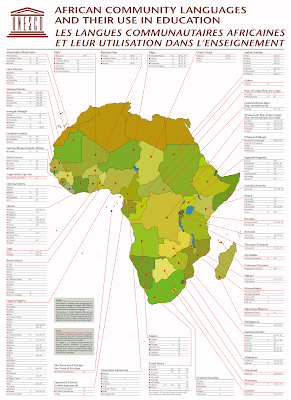 A wikified version of its Appendix 1 presenting 159 African community languages is included in the wiki. The publication covers quite a bit more than that and despite its age it is well worth the attention of anyone interested in language planning in Africa. This usage apparently emerged in the mid-1970s in Australia,1 as an alternative way to describe languages other than English and Aboriginal languages, in the place of problematic terms such as immigrant language or minority language. It is also used now in Britain for non-English, non-Celtic languages,2 and apparently is used in similar ways in other countries in the West. No problem with either of these takes (although inevitably there are critiques of any term used to describe any population or its attributes), but it is important I think to note the different frames of reference involved, and value of understanding these in their own contexts. As far as I am aware, "community language" has not been used much over the last 3 decades in discussing the sociolingistics of multilingual Africa (apart from a brief discussion in a recent book by Tove Skutnabb-Kangas3; I'd be grateful for any other examples). So it might be time to bring it back into discussion. A subcategory of community languages in the survey is "shared community languages" - what are now more commonly called "cross-border languages" (a term used internationally4). Once you look at languages across borders, the type of use in each country becomes a factor in characterizing overall usage. The graphic at the right is an example of what that looks like in the case of Hausa. There are two issues with the latter definition - first, it is incomplete, and second the conflation of "national" and "official." The latter confusion may be common ("official language" being another term with more than one definition and context of application), however in Africa there is most often an explicit distinction with regard to languages between statuses of "official" and "national" that the Dar es Salaam definition reflects. The differences in how these two terms are used in Africa on the one hand and in the West on the other merit a brief reflection. "Community" in one case seems to be more a matter of joining, where in the other, it is more a matter of setting or being set apart. "National" in one case is more plural, while in the other it is more exclusive. That is not to make a value judgement, but to the extent these impressions are valid, it is a difference with deeper origins and implications. Also, where there is a difference, the definition used in Africa is less well-known. This issue was already familiar from discussions about meanings of "national language," so I found it of note that there seems to be a similar dynamic in the case of "community language." This system, as I read it, is one of overlapping layers across which members of a multilingual society move, each with greater or lesser ease depending on education and linguistic portfolio. Outlining it in such a way calls attention to different levels of languages for purposes of planning and development. At the same time, one could argue that what I have been calling the Western definitions of community and national languages also can be seen as part of a system. But that is a different system, wherein the national language is dominant, and each community language persists among a demographic minority in specific limited areas. Back on the topic of the PanAfriL10n wiki - I have taken longer than planned to get it to the point where it can be announced formally. The goal is presentability, and to that end some glitches in the transfer had to be corrected, and some features added. In terms of content, some pages needed to be eliminated or rewritten. Full updating will require input from others (another level of challenge), but some updates and additions are more important to the overall product, so they are being done now. The longer term future of this wiki will depend on a number of factors, but if I'm investing time in it now, it is because there seems to be demand and there is not another resource that does what it attempts to do. More on all that when its return is formally announced. 1. Michael Clyne. 1991. Community Languages: The Australian Experience. Cambridge University Press. 3. Tove Skutnabb-Kangas. 2013. Linguistic Genocide in Education - or Worldwide Diversity and Human Rights? Routledge. 4. The French language Wikipedia has a lengthy article on this subject - Langue transfrontalière - but at time of access it had very little on Africa.